Using the nuclear dating method of Dr. W.D. Urry. from the Carnegie Institution in Washington D.C., scientists discovered that Antarctica’s rivers, sources of fine-dispersed deposits, were flowing as depicted on The Orontius Finaeus map, about 6,000 years ago. About 4000 years B. C., glacial sediments started to accumulate. 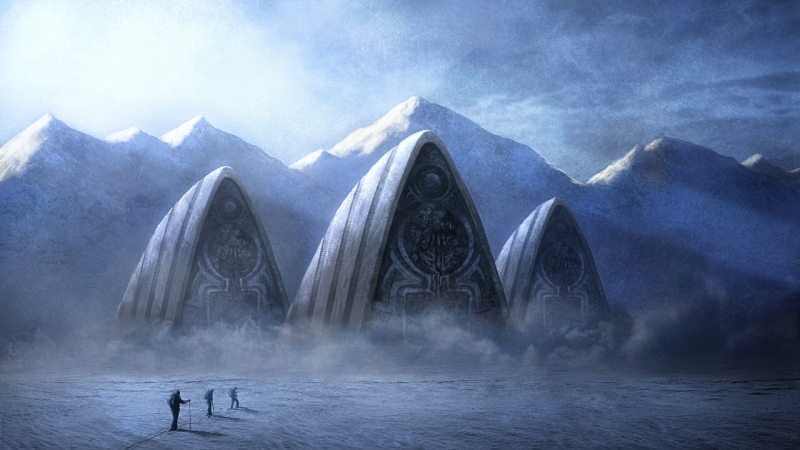 Is it possible that the lost civilization of Atlantis is buried beneath the Ice of Antarctica? Antarctica and Atlantis are two words commonly used in the same phrase. It’s not a mystery that many people firmly believe that Atlantis did, in fact, exist on Earth, and Antartica might just be the right place where we should search for Atlantis. But while Plato was the first to write about the lost city-continent of Atlantis, its noteworthy to mention that many Native American legends are reminiscent of what Plato sustained in the distant past, reinforcing suspicion that Atlantis could have existed. The legends of Native Americans come from different cultures separated by vast distances and isolated from one another. However, all of them tell a similar story of a once fallen civilization that existed in the distant past. In Central America, this ancient culture lived in Aztlan. According to legends, Aztlan was located to the south, on a white island and perished without warning as a result of natural catastrophic events. Many researchers maintain that Aztlan means “place of whiteness.” This is why it has commonly been connected to Atlantis and Antarctica, suggesting that Aztlan might have been the mythical Atlantis, the mythical place located to the south. It is said that after the catastrophic events, the survivors of Atlantis fled to different continents where their ancient civilization ultimately merged with others and disappeared. Skeptics will rush to discredit any theory linking Atlantis to Antarctica mostly because Antarctica today is a completely inhospitable and frozen environment where civilizations could not flourish. However, in remote antiquity most of Antarctica was hospitable. Proof of that is a number is enigmatic and ancient maps that depict the continent of Antarctica free of Ice. The most famous cartographical chart is without a doubt the famous Piri-Reis map, drawn by an admiral who served in the Navy of the Ancient Ottoman Empire. Interestingly, the Piri Reis map was based on a number of even older maps which accurately trace the coastline of Antarctica WITHOUT the layer of ice that covers it today. This indicates clearly that whoever had the technology and ability to survey the continent of Antarctica must have done so thousands of years ago before the continent was frozen. But how can a continent located to the south be free of Ice? Well, it turns out that Antarctica wasn’t always located where it is today. In fact, in the distant past, the continent of Antarctica wasn’t located at the South Pile, but instead somewhere between it and the Equator of our planet. This means that Antarctica was located farther north and experienced a tropical or temperate climate, meaning that it was covered in forests, and inhabited by various ancient life forms. What does this mean? Well… given the little we know about the life on our planet in the distant past, it is likely that people might have lived on this now, icy continent and developed as a society just like people did in Africa, Europe, and Asia. But how was this even possible? Thanks to a scientific theory called crustal displacement. According to mainstream scholars, and the theory of continental drift, the crust of our planet is in fact divided into several tectonic plates that literally ‘float’ over a molted inner layer, Over the ages, these plates slowly bump against one another. However, the theory of crustal displacement which expands the theory of continental drift, approximately every 40,000 years, the entire crust of our planet shifts as a single unit. After each ‘shift’ all the land masses on our planet, including entire continents are relocated to a new position on the planet. Many researchers believed that this happened the last time around 10,000 B.C. and caused the continent of Antarctica to move from its position near the equator to its current position, on top of the South Pole. “We take it for granted that Antarctica has always been a frozen wilderness, but the ice caps only appeared relatively recently in geological history,” told Jane Francis of the University of Leeds. Today, Antarctica is composed of around ninety-eight percent ice which is over a kilometer thick. So imagine, if in the distant past, ancient people inhabited Antarctica when it was covered with vegetation and forests, all of their “heritage” is now buried under a thick layer of ice. Even though it is uninhabitable today and only scientists venture out to Antarctica, in the distant past it might have been the perfect place for an ancient civilization to develop. All of this points to the undeniable fact that sometime between the 4th and 12th millennium B.C, there was an extremely advanced civilization on Earth, with great knowledge of navigation, cartography, and astronomy. Their technological advancements were way ahead of other cultures that would appear after them. This ‘lost’ civilization, most definitely preceded our modern civilization by tens of thousands of years. And many people firmly believe that this civilization could have been Atlantis, and evidence of their existence will be found beneath the thick layers of ice that currently cover the continent of Antarctica.